Starting a small at-home business can sound like a simple way to make money quickly. You get to keep expenses low and you never have to deal with employees. However, once your business gains traction and you start attracting more customers, it’s easy to become overwhelmed with everyday tasks and lose yourself along the way. 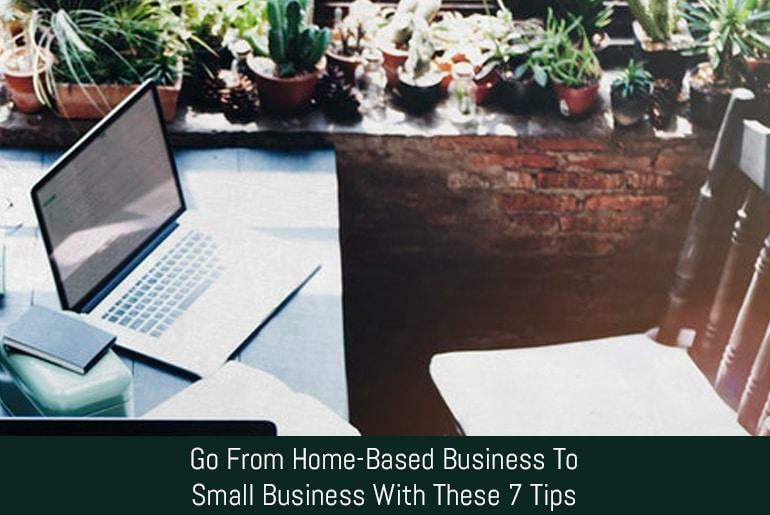 Here are a few tips to help you go from a home-based business to a small business profitably. Look for new ways to branch out and market your small business. This doesn’t necessarily mean that you’ll have to spend a boatload of money to be successful. Try online marketing methods like Google Adwords, as that allows you to target your ads to the right people at an affordable price. If you’ve already been using Adwords, try Facebook and Bing ads. Sometimes, posting more frequent content on social media can make all the difference. It’s hard to find time to do it, but if you can prioritize it, you may be surprised at the difference it makes. When you embark on the journey of running a small business, you need a solid business plan. This is a written document that outlines what you plan to do, why it will work, and what makes your business special. You talk about your organizational structure, employees, experience, competition and your products or services. You also outline your expenses and revenues. It’s important to stick to the business plan and be realistic. Allow some financial cushion for unexpected things. Many people mistakenly believe that in order to expand into a regular small business, you have to start hiring employees. This isn’t necessarily the case. By leveraging freelancers, you can expand your capabilities without having to take on payroll and employee benefits. You can expand your ability to handle work as you get more work to complete. Surround yourself with reliable freelancers that will help your business grow. However, before hiring them, make sure to establish some kind of a framework for successful collaboration with people working remotely. Owners of home-based businesses often make the mistake of trying to please everyone and be a “jack of all trades.” However, when you try to please everyone, you end up pleasing no one. Instead of trying to chase every shiny object that comes along, focus on one thing and get really good at it. Find a product that you can be successful with and stick with it. Once you have your footing with the new business venture, you can slowly start to add other products and services along the way. Take advantage of the network that you’ve already created rather than allocating all of your resources to get new customers. It is 5 times more expensive to acquire a new customer than it is to sell to an existing customer. Develop ways to get referrals from your existing customers. Give your customers a referral bonus or other incentive to give you a referral. Offer your customers different products that you sell that might complement what they’ve already purchased from you. This is referred to as cross-selling. If you offer them another product that adds on to the existing product or is even better in some way, that is called upselling. This can make a huge difference for your business. After you’ve had some success selling your product to your initial target market, don’t be afraid to expand and offer it to new customers. Sometimes the secondary market you choose works better than the initial market. Consider bringing out other related products or services to your target market as well. The drawback of working at home is that you’re not always around other entrepreneurs. Get out and network. This will give you a chance to meet mentors and like-minded people. Recognize that you don’t have all the answers and look for people that can help you. Overall, making the jump from home-based to small business can be extremely rewarding. Just take your time and don’t expect it to work overnight. One day you’ll look back and wonder how you’ve made so much progress in such a short time.